The Plot Twist - which fuses Italian and Hungarian flavours - is back on Saturday 2nd April for an afternoon and evening of Italian Craft Ciders with food in the shape of Piadina (folded Romagna flatbread filled with meat, cheese and fresh veggies...a great alternative to pizza) to eat while you drink.. This time the partners are Angioletti Craft Cider and The Piadina Project, and it will take place at The Shoreditch Arts Club in Leonard Street, Shoreditch. "Following their legendary appearances in Soho and Shoreditch, the irresistible Plot Twist is back again for the sixth time! 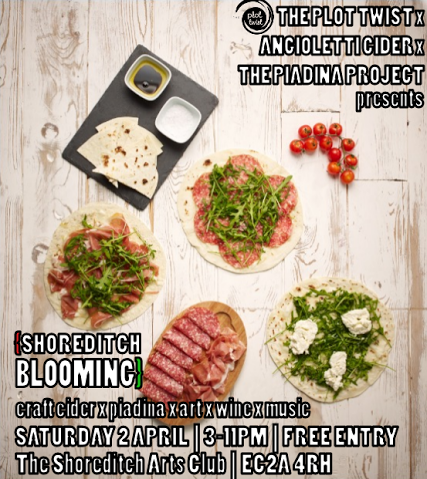 This time the Hungarian-Italian pop-up bar teamed up with Angioletti Italian Craft Cider and The Piadina Project to celebrate the long-awaited arrival of spring on Saturday, 2 April at The Shoreditch Arts Club. The Plot Twist is pleased to open up the spring season with Angioletti’s free tasting of Italian craft ciders. Made from 100% fruit juice, the unique pair of `Rose with Blueberry`and `Secco` (100% Italian apples) will refresh all our guests after the long, grey winter months. As always, The Plot Twist will feature delicious drinks, art and music. Quality Hungarian wines will accompany Italian classics on the drinks list, alongside spring-time craft beers from East London Brewery and spirits from both countries. An art exhibition by Nadia Ugobuono and DJ set by Mazuro will guarantee an unforgettably blooming experience."